The first frozen high mountain Inca human sacrifice was found atop a peak in Chile in 1954. "La Momia del Cerro El Plomo," the Mummy of El Plomo Peak became its name, and until Juanita, it was heralded as the best preserved. Scientists were able to establish many of the El Plomo mummy's vital statistics: he was male, 8 or 9 years old, type O blood, and presumably from a wealthy family due to his portly physique. A unique set of circumstances made the discovery of Juanita possible. The eruption of a nearby volcano, Mt. Sabancaya, produced hot ash, which slowly melted away the 500 years of accumulated ice and snow encasing the mummy. A brightly-colored burial tapestry, or "aksu" was revealed, the fresh hues remarkably preserved. Since the heavy winter storms had not yet covered the body, Dr. Reinhard was able to recover the mummy. The fact that ice preserved the body makes Juanita a substantial scientific find. All other high-altitude Inca mummies have been completely desiccated—freeze-dried in a way—much like mummies found elsewhere in the world. Juanita, however, is almost entirely frozen, preserving her skin, internal organs, hair, blood, even the contents of her stomach. This offers scientists a rare glimpse into the life of these pre-Columbian people. DNA makeup can be studied, revealing where Juanita came from, perhaps even linking her to her living relatives. Stomach contents can be analyzed to reveal more about the Inca diet. Juanita is the closest sacrifice to Cuzco, the Inca capital. This, in addition to the fact that the clothing she was wearing resembles the finest textiles from that great city, suggests she may have come from a noble Cuzco family. The almost perfectly preserved clothing offer a storehouse of information, giving insight into sacred Inca textiles, as well as how the Inca nobility dressed. It took incredible effort to hold sacrificial rituals in the thin air and life-threatening cold of the high Andes. At 20,000 feet, near the summit of Mt. Ampato where Juanita was found, Johan Reinhard discovered extensive camps or "rest stops" on the route to the ritual site at the summit. Evidence of Inca camp sites atop Ampato include remains of wooden posts for large, blanket-covered tents, stones used for tent platform floors, and an abundance of dried grass used for walkways and to insulate tent floors. These are heavy materials that must have been hauled many miles up the barren mountainside. 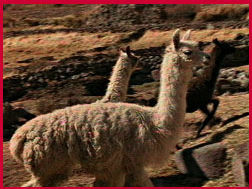 The trek itself to the sacrificial site was a remarkable undertaking, involving whole entourages of priests and villagers, provisions, water, as well as symbolic items used in the ritual, all carried on the backs of hundreds of llamas and porters. A month after Reinhard's amazing discovery of Juanita, he returned to Ampato with a full archaeological team to explore Ampato further. This time, several thousand feet below the summit, they found two more mummy children, a girl and a boy. It is believed these may have been companion sacrifices to the more important sacrifice of Juanita on Ampato's summit. These children may have also been buried as a pair in a symbolic marriage. A Spanish soldier who witnessed such sacrifices wrote in 1551: "Many boys and girls were sacrificed in pairs, being buried alive and well dressed and adorned....items that a married Indian would possess." Buried with them were cloth-covered offering bundles, nearly 40 pieces of pottery, decorated wooden utensils, weaving tools, and even a pair of delicately woven sandals. At an elevation equal to that of Mount McKinley, the highest peak in North America, these sacrificial burial sites have preserved the Inca past more vividly than any other discovery, adding a deeper understanding of one of the world's great civilizations. Photos: (1) courtesy The Mountain Institute.